In its perpetual portfolios, the Foundation seeks to achieve a return equal to the target spending policy (currently 5%) plus an incremental return in excess of inflation – measured as the Consumer Price Index for Urban Consumers. The Foundation seeks to avoid the pitfall of home country bias and looks to take advantage of the opportunities available to long time horizon investors. Furthermore, the Foundation employs the well documented effects of diversification throughout its investment strategies. The Foundation is invested in domestic, international and emerging market equities (both public and private). Equities are deemed to provide the best inflation adjusted growth component for the Foundation. In an effort to reduce volatility of returns and provide a core inflation component, the Foundation invests significantly in domestic fixed income assets including high yield and inflation protected bonds. Finally, to capture the potential returns of uncorrelated assets which can also provide protection against inflation, the Foundation invests in real assets – both real estate and commodities – and hedge fund investments. The Foundation does not directly engage in the use of leverage or derivatives at the portfolio level, but will allow their use by managers who have a demonstrated skill in managing their implementation. Long-term Capital Appreciation Investment Pool. 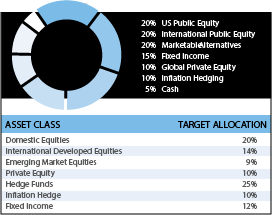 The Legacy Perpetual Fund is a highly diversified portfolio invested across a broad array of asset classes including public and private equities, bonds, and hedge funds. The fund seeks to employ the best investment strategies that combine academic theory, informed market judgment and independent thinking which may include contrarian thinking. With a perpetual time horizon the fund attempts to take advantage of long-term investment opportunities that maybe illiquid in nature and may utilize strategies not available to all market participants. 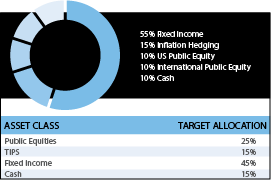 The fund has a target return of inflation plus 5%. Assets of the fund are fully exposed to market risks and may experience significant volatility and principal loss. Assets of the fund are fully exposed to market risks and may experience volatility and principal loss. The volatility of the fund is expected to be lower than that of the Legacy Fund. This fund is appropriate for assets that will remain invested with the fund between three and seven years. Estimated investment management fees: 11 basis points. The Legacy Grantmaking Fund is invested solely in cash and cash equivalents with the stated intent to preserve capital. Assets invested with this fund are expected to be distributed as grants within two years.